Library and Archives Canada holds an extensive collection of governmental and private records generally consisting of textual documents on paper or on microfilm as well as publications and films about internment camps located in Canada during both World Wars (1914-1918 and 1939-1945). Please note that this guide relates mainly to the internment camps in Canada. At the end of this guide, you will find a section devoted to internment camps abroad. Some of our microfilm reels with the prefixes C, H and T are digitized on our partner website Héritage. Digitized reels can be viewed free on that website. Enter the microfilm number in the search box, e.g. T-2366. If the reel is digitized, click on the reel title to see the images. You can browse through the page images; the content (text) is not searchable. Also note that an image/page number is not the same as an archival document page number. The First World War (1914-1918), also known as the Great War, began on August 4th 1914 with the declaration of war by the British and the French governments against the Imperial German Empire and the Austro-Hungarian Empire. The British declaration of war was made on behalf of Britain and her Dominions. Thus, Canada was immediately implicated. From the outset, the Canadian government adopted many measures by Order in Council to respond to the new exigencies of war, including the restriction of some civil liberties. Canadian authorities were given the right to arrest, to detain, to censor, to exclude, to deport, to control or to capture all persons and property considered as a potential threat to Canada. Any resident not naturalized who had been a citizen of the now enemy states were considered de facto "enemy illegal residents." Some of these persons were ultimately subject to detention in camps. The War Measures Act was subsequently approved by Parliament. The Act in addition to authorizing future actions, also legitimized the decisions implemented in the early days of the war by the Privy Council (Cabinet). Signed in 1907, the Hague Convention guaranteed the rights of prisoners of war held in camps. The rules of the Convention were not always or completely respected by Canada during the First World War. The Convention made a distinction between prisoners of war and civilians but, the Canadian authorities to a large degree ignored this distinction. The twenty-four camps that accommodated internees were mostly located away from cities, such as remote areas in the Rocky Mountains. The majority of civilian internees were of Ruthenian, Galician and Bukovinian origin. They were considered enemies because what is now Western Ukraine was, at that time, part of the Austro-Hungarian Empire. The other internees were either German or Austrian residents in Canada. There were also some German prisoners of war held in the camps who were transferred from England. There were no Turkish prisoners of war in Canada. The Hague Convention, 1907: Full text of the treaty which concerns the treatment of prisoners of war. The Canada Gazette: Official publication of the Government of Canada, notably containing Orders in Council. In Canada during the First World War, internees were divided into two main groups in internment camps: citizens of Austro-Hungary (mostly Ukrainians) and citizens of Germany. Prisoners from the Austro-Hungarian Empire were mainly residents of Canada from what is now Ukraine. Many still had Austro-Hungarian citizenship and were therefore considered to be resident enemy aliens. No prisoners of war from the Austro-Hungarian Empire were held in Canada. Some German citizens living in Canada were arrested and detained in internment camps. Because Canada also served as a place of detention for German prisoners of war on behalf of the British, they formed a large proportion of the internees. The following chart provides the name of each camp, the type of buildings used and the dates of operation. There are a variety of documents on the internment camps listed above in the collections of Library and Archives Canada. The finding aid previously available only in the reference room has been digitized and is available in pdf format. The Canadian government records consist mainly of administrative textual documents such as lists or reports. Exeats (Exit Forms) to the list of registration of enemy aliens, 1914-1918, series I-A-1, volume 604, microfilm C-10671. Internment camps collection, 1915-1918, 170 photographs of Vernon internment camp, B.C. NPC 1975-262, 32 photographs of Yoho internment camp, B.C. Private records, for the most part, contain a variety of documents ranging from photographs to letters collected by and from individuals and associations. George Macoun was a guard for the 2nd Canadian Garrison Regiment. Item consist of a letter describing the experience of George Macoun as a guard at Kapuskasing, Ontario. Collection consists of photographs and views of the landscape at Spirit Lake internment camp 1916. Item consists of a photograph of guards and internees at Kapuskasing in July 1916. Collection consists of amateur mounted prints showing many aspects of the Spirit Lake internment camp. Library and Archives Canada holds many records relating to the internment camps in Canada during the Second World War (1939-1945). On one hand, there are archival records, public or private, consisting of textual records, photographs, microfilm or works of art. On the other hand, there are published works such films, audio tapes, monographs, biographies, etc. Canada entered the war against Nazi Germany September 10, 1939 but, the procedures for establishing internment camps were already under way for several weeks. Therefore, on September 3rd, the Canadian government adopted the Regulations for the Defence of Canada by Order in Council. In addition, the War Measures Act is passed, allowing authorities to govern by decree. One of these Orders in Council banned Communist, Nazi, and Fascist organizations. On September 4th 1939, the government appointed a senior official to be responsible for operations of the internment camps and gave the responsibility for construction and maintenance of camps to the Department of National Defence. The first German prisoners of war arrived in Canada in early Fall of 1939. Transfer camps are set up to receive them in large urban centers like Montreal, Toronto, Winnipeg and Vancouver. Starting in June 1940, most detainees were transferred to permanent camps such as Petawawa (Ontario) and Kananaskis (Alberta). In accordance with the Geneva Convention of 1929, prisoners of war were held separately from internees. When Italy declared war against the Allies on June 10th 1940, residents of Italian descent were deemed suspicious and were subject to internment. The Japanese in Canada became subject to detention at the beginning of 1942. It is noteworthy that no Italian or Japanese military personnel were imprisoned in Canada. With the exception of the Japanese, the majority of refugees and other civilians are released before the end of 1943. There is a list of enemy aliens transferred to Canada during the war of which the vast majority are of German origin. There are also Italians listed. Many camps are reconfigured to receive prisoners of war who continued to arrive in Canada. After 1943, prisoners held in Canada were almost all German military personnel and to improve the efficiency of classification of prisoners, they were assigned colors according to their allegiance to Nazism. Anti-Nazis were assigned to classed as Whites; those with no particular allegiance were Grays, were and; Nazi hardliners were Blacks. There were also more subtle color groupings (eg. light gray or dark gray). In May 1945, there were nearly 35,000 prisoners of war held in Canada. Please note that archival documents of the Department of National Defence related to Second World War internment are generally organized by camp. The War Measures Act: Act adopted in 1914 and reintroduced in 1939 which gives additional powers to the government of Canada. Geneva Convention, 1929: Contains the full text of the international treaty on the treatment of prisoners of war camps. Germans and Japanese made up the majority of prisoners in internment camps in Canada during the Second World War. There were other groups of internees but together they were a small proportion of the total numbers. Therefore, there is less information on these groups available within the collection of Library and Archives Canada but, it is equally accessible. The first German prisoners arrived in Canada in the days following the declaration of war. They were either Jewish refugees or enemy merchant seamen. Prisoners of war soon followed. They were first received at stations located near major urban centers like Montreal, Toronto, Kingston, Vancouver, Niagara, etc. These stations were temporary receiving camps since the "permanent" camps were not yet ready. Many other prisoners are added over the years. The majority of the prison population in Canadian internment camps were made up of Germans. There are access restrictions for microfilm reels T-7051 to T-7053 as they contain the medical records of German prisoners held in Canada. Japan entered the war against Canada in December 1941. Many civilians and refugees were interned but no Japanese prisoners of war were interned in Canada. Some would be subject to repatriation to Japan at the end of the war. The War Measures Act allowed Canadian authorities to intern Canadian residents of Japanese origin (including women and children) and to seize their assets. In June 1940, Italy entered the war alongside Germany. Consequently, Italian citizens living in Canada, and Canadians of Italian origin who were suspected of being sympathetic to the Fascist cause were arrested and interned in camps. No Italian military personnel were imprisoned in Canada during the Second World War. Many Jews fleeing persecution and violence of war in Europe sought refuge in Canada. Some were residents or citizens of enemy countries and therefore were regarded as enemy aliens and interned in camps upon arrival in Canada. Mennonites are Christian evangelical Protestant pacifists and many were conscientious objectors during the Second World War. Consequently, they were considered a suspect group and many were interned. Women were equally subject to internment during the war. With the exception of Japanese Canadians, very few were interned. Non Japanese women internees were held at the women's prison in Kingston, Ontario. They were released by the summer of 1943. The following chart provides the name of each camp, the type of internees and the dates of operation. There are a variety of documents on the internment camps mentioned above in various archival records at Library and Archives Canada. The finding aid previously available only in the reference room has been digitized and is available in pdf format. Government records about Canadian camps during the Second World War are mostly administrative or operational. They are organized according to the department that produced the documents, and they are primarily textual. It should be noted that these documents are mostly written in English. Cabinet Conclusions, Admission, removal of enemy aliens (German), naturalization and exemptions from service, 1949-1954, series A-5-a, volumes 2644, 2646, 2648, 2656, microfilm reels T-2366, T-2367 and T-2369. List of enemy aliens, 1939-1947, series I-A-1, volumes 446 and 447, microfilm C-10322. Enemy Aliens from Britain sent to Canada, 1940-1946, volumes 454 and 455, microfilm C-10327. List of enemy aliens and enemy alien seamen, 1942-1947, volume 447, microfilm C-10323. Enemy aliens and prisoners of war from Britain, 1940-1942, series F-3, volume 3565, file C11-19-4-1, parts 4 to 8. Registry files on PoWs and internment operations and subject files, 1919-1964, series R196-154-1-E to R196-156-5-E (RG18 F-3). Department of External Affairs fonds R219-0-2-E, 1940-1960, reference #05836-05838, NPC 1980-119, 646 photographs. Files on German and Italian PoWs and Canadian citizens with questionable loyalty, 1939-1945, R112-133-X-E (RG24 C-5), volumes 1589-1595, 6576-6595, 11244-11273, microfilms T-7020 to T-7057. Fonds consists of textual records of the Royal Commission to Investigate Complaints of Canadian Citizens of Japanese Origin who Resided in British Columbia in 1941, That Their Real and Personal Property had been disposed of by the Custodian of Enemy Property at Prices Less than the Fair Market Value fonds, 1935-1950, (R1150-0-0-E (RG33-69), volumes 1 to 79. Part of Department of Justice fonds (R188-0-3-E), contains correspondence, transcripts, reports, exhibits and other records on Regulation 21, 1939-1941, R188-67-2-E (RG13 F-12), volumes 964 to 971. The archival collections created or donated by individuals and associations contain a variety of documents ranging from paintings to photographs and letters. Most of these collections contain multiple documents. The descriptions are only available in English. Otto Thierbach emigrated from Germany to Canada in 1928 and settled in Montreal. During the 1930s he joined the "Deutsche Bund" and worked as "Bund" organizer for eastern Canada until 1939, when he was interned at the Fredericton Internment Camp until 1945. Fonds consists of correspondence, identification card, photographs and postcards. 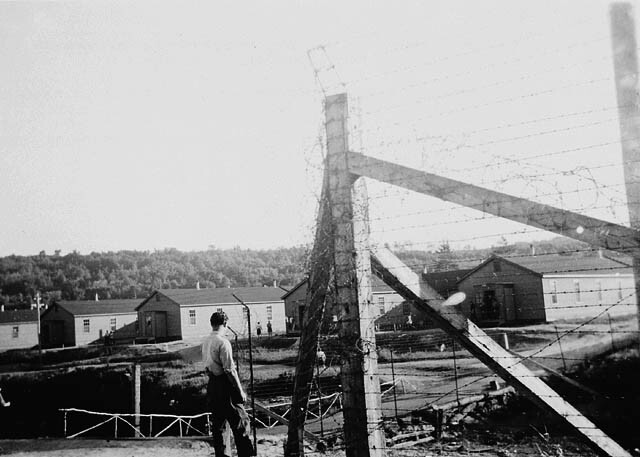 Fonds consists of photographs of Fredericton internment camp in New Brunswick as well as views of the Forestry Experimental Station and internment camp at Kananaskis, Alberta; and wood carvings and paintings made by internees. Born in 1919 in Germany, Eric Otto Koch, of Jewish descent, was interned as an enemy alien in July 1940. Released in 1941, he became a writer and broadcaster. Fonds consists of correspondence, documents from other internees, memoirs, poetry, dramas, paintings and scripts of interviews and films as well as photographs. Carl Weiselberger emigrated from Austria in 1939 to England. He was interned and deported to Canada and released in 1943. He became a journalist for the Ottawa Citizen. Fonds consists of short stories such as descriptions, accounts of activities, recreation, meals, and scenes of daily life in a camp. Oskar Demuth immigrated in Canada in 1913. He worked as a businessman for the German community in Winnipeg until he was interned in September 1939. He was released in 1945, and resumed his commercial activities. Fonds consists of an autobiographical account describing the experience of camps. Microfilm M-7495. Series consist of correspondence with family in both German and English; educational, medical and financial records, as well as correspondence during his internment. Bernard Pfundt was fleeing the war when he was interned first in England then in Canada, in 1940. He was released in 1943. Fonds consists of letters, a manuscript, observations, thoughts and experiences on internment. Contains one watercolour of Camp B in Little River, New Brunswick by Max Gamper when he was interned. Heinrich Holtmann immigrated to Canada in 1928. Living in Manitoba, he was interned in 1940 in Kananaskis, Alberta. He was released in 1942. Fonds consists of correspondence and letters. Gerald Frey was interned in 1939 in England as a young German student. Sent to Canada in 1940, he was released in 1941. He then received permission from the British to continue his studies. He joined the British army in 1942 and served with the occupation forces in 1945. He immigrated Canada in 1950. Fonds consists diary notes, memoirs, letters and experiences as an internee and soldier. Grace Tucker emigrated from England in 1905. She was a welfare worker who worked with the Japanese Canadian internees during the Second World War. Working with the Anglican Church at the end of the war, she helped with the resettlement of Japanese Canadians. Fonds consists of correspondence, petitions, notices, minutes, agendas, news bulletins, articles, memoranda, forms, pamphlets and photographs. Charles Stanley Gallop emigrated from England in 1891 and fought in the First World War. In the Second World War, he enlisted as a guard at Red Rock internment camp, Ontario. Series consist of files on various subjects including files on the Interdepartmental Committee on Internment Cases. Giuseppe Grittani emigrated from Italy and settled in Toronto. He founded the Italian-Canadian Economic Board, a board responsible for the exhibits at the Canadian National Exhibition. He was interned at Petawawa during the Second World War. Fonds consists of scrapbooks, newspaper clippings as well as correspondence and photographs. Born in British Columbia, Thomas Shoyama published a newspaper before he was interned along with others from the Japanese Canadian community during the Second World War. He was briefly part of the Intelligence Corps of the Canadian Army in 1945. After the war, he occupied many government positions and taught at universities. Fonds consists of correspondence, reports, speeches, memoranda, honorary degrees, awards, circulars, clippings, photographs and drawings. Masajiro Miyazaki emigrated from Japan and lived in British Columbia, working as a surgeon, until he was interned in 1942. Fonds consists of draft memoirs and correspondence, statistics and surveys, memoranda, lists, notes, lists, clippings, reports and photographs. Keitaro Matsubara immigrated to Canada in 1907 and settled in British Columbia. First, he worked as a merchant, later becoming a clergyman with the United Church of Canada. He was interned in 1942 in Holmwood, Manitoba. Fonds consists of diaries, photographs, certificates and documents. The Japanese Canadians collection is an assembly of various smaller units from many donors. The fond consists of documents, clippings, outlines and interviews, reports, issues, newspapers and photographs. The Japanese Canadian Citizens Association (JCCA) was formed in 1947 with the primary roles of helping claimants before the Royal Commission of Japanese Property Losses (Bird Commission) and fighting the discriminatory laws. Fonds consists of records of the JCCA and documents of business operations. It also contains briefs, files, literature, accounts and historical notes. Mitsuru Shimpo emigrated from Japan in 1962. Shimpo has authored a number of books which focus on the sociological aspects of Aboriginal experiences in Canada, and Japanese Canadian internment. Fonds consists of oral interviews and recordings of discussions. Born as Moishe Wolofsky, Walsh grew up in Montreal. In the 1930s, he worked in the USSR as metal worker. After returning to Canada, he adopted the name William Walsh and then joined the Communist Party of Canada in 1935. He was interned in 1940 and released in October of 1942. He then joined the Canadian Army and fought in Europe. At the end of the war, he became a labour activist and negotiator. The fonds consists of correspondence, notes, awards, decisions, reports, collective agreements, submissions, minutes, negotiation papers, printed matter and photographs. Peter Krawchuk emigrated to Canada in 1930 from Poland. He was a member of the Communist Party of Canada. Krawchuk was interned in 1940, released in 1942. He worked as a journalist for the Canadian Ukrainian Press. The fonds consists of correspondence, diaries, draft articles, manuscripts, photographs and other materials. Arriving in Canada in 1928, Bertha Hower was interned in 1940 and released in 1942. Fonds consists of a brief presented by the Minister of Justice against Hower's internment. A limited list of records relating to Canadian internment camps, which covers both the First and Second World War, is available. The research guide for each war is mentioned earlier in this guide. The series contains files on various topics including records of the Interdepartmental Committee on Internment Cases. These records are held by the International Committee of the Red Cross in Geneva. These records are held by the International Committee of the Red Cross in Germany. These records are held by the International Committee of the Red Cross. The International Tracing Service (part of ICRC) handles all requests concerning civilian (non-combatants). The organization can search those records that have survived. For inquiries from Canada, you must contact your local branch of the Red Cross which will then forward the request to a responsible office in Europe. Library and Archives Canada also has documents on the internment camps located outside of Canada. The finding aid previously available only in the reference room has been digitized and is available in pdf format.